Will Pioneer Institute knock out Common Core? 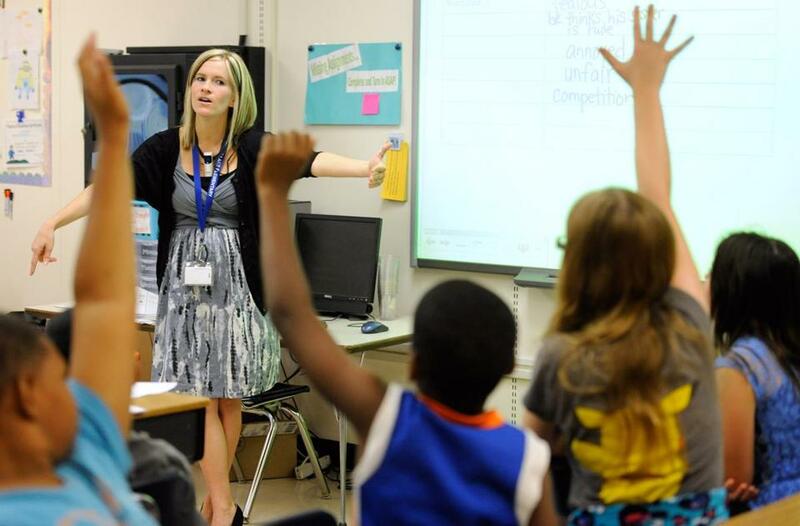 A teacher at a Delaware elementary school that began implementing the Common Core standards taught a fifth-grade language arts class. While kids are (possibly) doing summer reading, some activists are working hard to flunk the Common Core. Four years ago, when 44 states had adopted the K-12 curriculum standards, the whole thing seemed quiet and inevitable. Today, resistance is everywhere: from teachers and parents who chafe over testing requirements to Tea Party types who see the whole thing as government overreach. Some states are now dropping out. Chalk it up to a big victory for a small think tank on Devonshire Street. For decades, the independent, libertarian-leaning Pioneer Institute has loomed large in Massachusetts policy debates. Now, it has a national profile as the brains of the Common Core opposition. Pioneer came to the fight early and seeds it frequently. Its research papers, written by respected players in education, raise important, provocative questions about how the new standards will play out in practice. So it’s sad that the public rhetoric often operates on the dog-whistle level. Last fall, Pioneer’s executive director, Jim Stergios, was interviewed by Elisabeth Hasselbeck on “Fox and Friends,” in a baffling segment about one fifth-grade grammar worksheet, which used sentences that had odd interpretations of civics. Then there was this spring’s Pioneer report on poetry in the Common Core, titled “The Dying of the Light.” It was written with a literary flair that you seldom find in research tomes. But its conclusion felt like poetic license: that, because some Common Core documents were written in dry bureaucratese, its creators were clearly enemies of poetry and love. Pioneer is better than that, and so is Stergios. A onetime teacher who speaks several languages, he’s fearful that the Common Core will dilute the 1993 education reform effort that brought Massachusetts the nation’s highest standards. He’s deliberate and well-reasoned, and talks regularly to his political opponents, including the Common Core’s chief architect, David Coleman. Much of the debate over the Common Core comes down to which of these men you trust more: Coleman, who thinks the new standards will improve a system that doesn’t prepare Americans for the world, or Stergios, who says the whole thing is ripe to be ruined by bureaucrats. It’s not an unreasonable fear. Buried inside that artsy poetry report was a story about a consultant to an Arkansas school system, with no experience in teaching English, who ordered up what sounds like the world’s worst lesson plan. The Common Core does have the potential to be exploited by textbook makers, tech companies, and consultants. It could also be misinterpreted by skittish teachers, whose evaluations will be tied to test results. “We have to be really careful about piece-of-paper versus real-world reform,” Stergios said. But for the most part, these are worries about implementation, not about the standards themselves. Some education specialists, who have studied both the Common Core and Pioneer’s resistance, point out that the two sides have similar goals for students nationwide. “I don’t think there’s quite as much distance between where the Common Core ended up and what [Pioneer] wanted to see than their vocal critiques suggest,” said Kathleen Porter-Magee, a policy fellow at the Fordham Institute, a conservative education think tank. Porter-Magee supports the Common Core because it emphasizes content, complexity, and — despite some hype that suggests otherwise — standard algorithms in math. It acknowledges that schools, even here in Massachusetts, need to shift the way they teach. The Pioneer Institute in Boston came to the fight early and seeds it frequently. Pioneer, with its ties to deep expertise, is in a great position to lead that conversation — and to set the Elisabeth Hasselbecks of the world straight. The institute might well succeed in its effort to knock out the Common Core. But if that happens, what comes next for education?